175 recipes for quick and delicious meals in the Instant Pot—today’s hottest kitchen appliance—that the whole family will love for under $12 a meal. Eating well doesn’t need to cost a fortune. And with the Instant Pot, it no longer requires a lot of time or effort. Now create budget-friendly meals that are fast and delicious using your favorite cooking gadget. 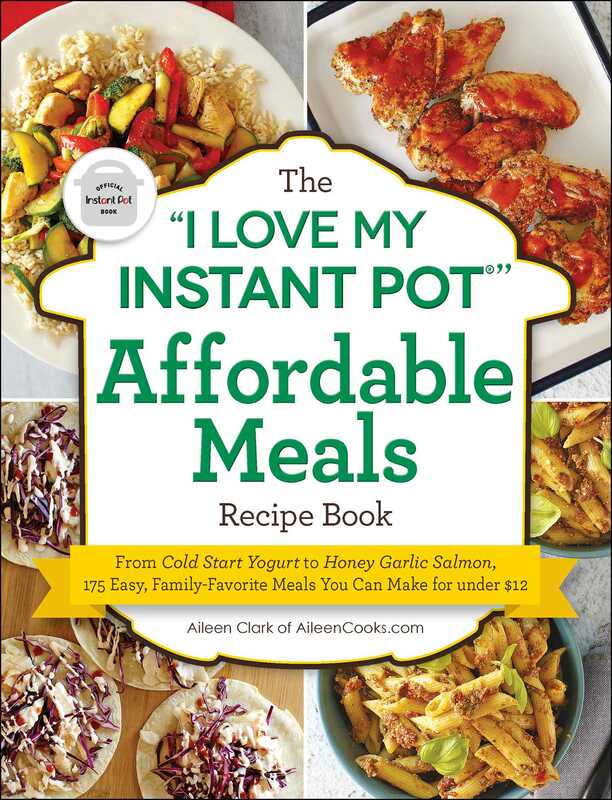 In the “I Love My Instant Pot®” Affordable Meals Recipe Book, Aileen Clark shows that it is possible to eat healthy, filling meals while on a budget. With 175 recipes and photos throughout, this is a must-have cookbook if you are looking for good meals that are easy on the wallet. Save money and reduce your monthly food budget with practical approaches to grocery shopping. With a cost estimate included for each recipe, you can easily stay on budget and manage your food costs ahead of time so you can be better prepared with your expenses. Featuring an easy-to-understand overview of how to use the Instant Pot, this is the perfect guide whether you are new to the Instant Pot or an expert. With satisfying, whole-food dishes for every meal of the day, this cookbook makes using the Instant Pot easier and cheaper than ever! Aileen Clark is a recipe developer and food blogger at AileenCooks.com. She has been featured on Huffington Post, Today Parents, and Money Saving Mom and her recipes have been shared on Food Gawker, ParadeCommunity Table, Country Living, and Happy Hooligans. She was recognized as one of the top parenting bloggers in Sacramento and has partnered with many major brands, including: NABISCO, Better Than Bouillon, Red Baron, Ling Ling, Huggies, Fisher-Price, StarKist, and Macy's. Aileen's mission is to connect with other moms in a way that helps make their lives easier and more fun. She loves creating new recipes for the Instant Pot and runs an Instant Pot group on Facebook focused on troubleshooting recipes and helping new users find success with cooking in the Instant Pot. Aileen lives in Northern California with her husband and three children.